iOS 6 Maps: A risky strategy for Apple. 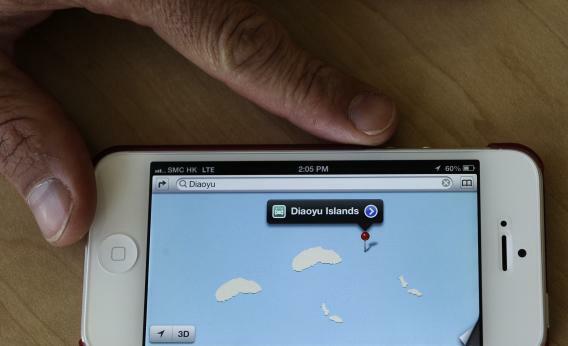 An Apple iPhone 5 map application, utilising the new iO6 software, shows two sets of the disputed islands in the East China Sea, known as the Senkaku islands in Japan and claimed by Beijing under the name Diaoyu, in Hong Kong on September 22, 2012. I think we’re starting to get a sense of the business strategy behind Apple’s decision to go with an inferior new Maps product in iOS 6. One key datapoint is The Verge’s reporting that there was over a year left on the existing Apple/Google maps deal, which tells us that this was a deliberate strategic decision on Apple’s part and not some kind of last-minute breakdown in negotiations. The other is my colleague Will Oremus’ point that Google keeps rolling out new features including awesome new mapping of the world beneath the sea. Basically Apple’s problem was that as long as their Maps app was Google powered it would never be the best mobile mapping app in the world. Back when I had an Android phone a year and a half ago, I liked almost everything about it less than I liked iOS but even back that the map gap was substantial and I’m not even in a position to use turn-by-turn navigation on a regular basis. Apple’s problem, strategically, is that they don’t have a superior alternative to the old Google-powered maps to offer and they had no way to build one without gathering user data. The timid approach to the situation would be to just stick with the best available app—the one powered by Google—and keep selling phones at ridiculously high profit margins until people stop buying them. What they’ve actually decided to do is much riskier: Take advantage of Apple’s extraordinarily strong market position right now to release an inferior map product in hope that doing so will let them build a superior product down the road. The risk, obviously, is that they’ll never actually deliver on this promise. There’s no doubt that in twelve months’ time the iOS Maps app will be better than it is now, but so will Google’s Maps for Android. Given the fact that Google has both a head start and mapping institutional know-how there’s no particular reason to believe that Apple will ever be able to release a superior product. All we know for sure is that right now Apple’s saddled with one that’s worse in some ways from what they already had. But what they achieve by ending the relationship early is a chance to some day—hopefully soon—have the very best maps experience in the world. Under iOS 5 they didn’t have that, and as long as Apple depended on Google they were never going to have it.